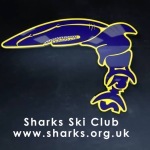 Our Introductory sessions are designed to give you a taste of what Sharks Ski Club can offer. The sessions run on Saturday morning between 9 and 11 am. We recommend that you arrive at 8:30 in order to meet the team, and your dedicated instructor for the morning, and allow enough time to organise equipment. You will need appropriate clothing for an indoor snowdome. Helmets and gloves are mandatory. Helmets, skis and boots can be borrowed from SnoZone as part of your slope fee. The first half of your introductory session will be a one-to-one lesson with one of our qualified instructors. After this you will join a Sharks group appropriate to your skiing ability. There is no commitment after the session to joining the club, but we are always on the look-out for new members. Annual Membership costs £25 per person or £60 for a family of 3 to 6 living at the same address. You will need to purchase a Sharks Ski Club slope pass from the front desk at SnoZone, and pay subs of £2 per person to cover Instruction. If you would like to book a session then please email us by clicking here… and one of our instructor team will call you back.